Hello people of the internet! Finally getting back into a normal posting routine! 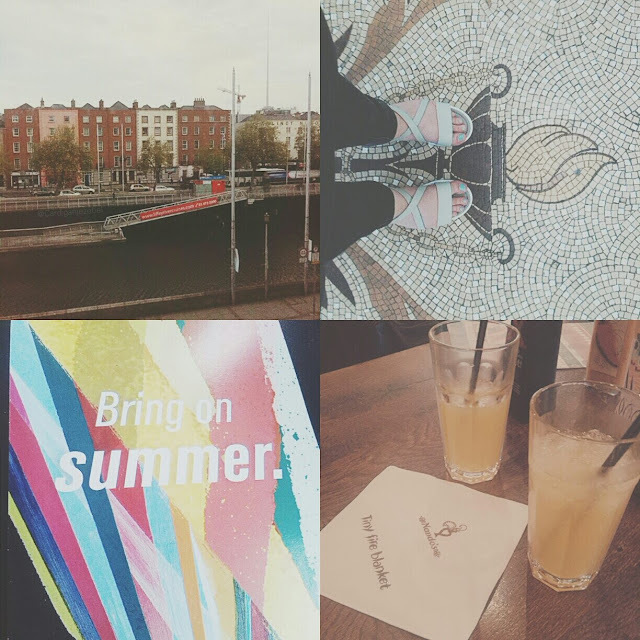 Today's post is all about day two of my recent Dublin adventures. I started my day half eight that morning. When I stay in hostels I like to give myself plenty of time to wake up before I need to check out. We stayed in Abigail's Hostel this time. This might be the best hostel I've stayed at, in Dublin! It was so cozy, yet we had plenty of room. The staff was amazing, free luggage storage, and 24 hour reception. Plus, the price was pretty cheap for being right on the Liffey and directly behind Temple Bar. (Sorry for the mini review. I would totally recommend it though!) Anyways, I woke up and checked my social media and gave Dan a while to sleep in. The first picture is from right outside of our window. Like I said, it's was the perfect location! We got dressed and packed our bag before heading downstairs for some free breakfast (this place just get's better and better, huh?). Dan and I were trying to figure out how we wanted to spend the day since the awards weren't until 7:30pm. We rarely have like a full day to just explore and chill out when we're in Dublin since we're usually there for a particular reason. This time we decided to do some of the more tourist-y types of things. The weather was actually perfect so Dan and I decided to do some walking. We started off by having a stroll through Trinity College. I never knew how big the campus was! It was beautiful. After admiring the architecture and deciding the line for The Book Of Kells was absurdly long, we headed to the National Library. I love taking "From Where I Stand" pictures and the National Library of Ireland and the National Museum have some of the most beautiful tiled floors. So, please try to not judge me for taking pictures of my feet, haha . For me it's like actual proof I was there. Dan and I spent a lot of time looking up our ancestry before heading across the road to the Museum. Obviously the museum and the library had very strict rules as to where I was allowed to use my camera. So, these are two of the nicer photos I was able to get. It was so interesting and beautiful. I'm a sucker for amazing architecture and a good bit of history! Originally, we were going to go to the wax museum but we ended up spending so much time here instead! Maybe next time? We decided it was time to search for some food. When it comes to food in Dublin, we like to try new stuff when we can. Eventually we decided on some cheeky Nando's. It was a borderline religious experience! Also, just a hilarious one. If you've been to Nando's before, you know that they're famous for their Peri-Peri sauces. They come in multiple varieties of spice and some have different herbs. I some how convince Dan to try their black label, Extra, Extra, hot sauce. By far one of the best moments of my life. I'm pretty sure I saw steam come out of his ears! Thank god for bottomless refills on drinks, right? After an amazing meal, we decided to head over to Starbucks. I have no idea how I've managed this two years in a row now, but I always end up in Dublin when they do half price Frappe's! I'm pretty sure my drink was the size of my head! After a nice sit down, we finally ran the errands that we needed to do since we left the hostel. I ended up getting ready in a shopping center bathroom #classy, and we headed off to Lillie's Bordello for the Irish Beauty Blogger Awards. The bar was honestly one of the most magnificent places I've ever seen. It was decorated like a 1920's burlesque club. My younger self would have been so proud that I made it to a place that looked exactly like the club in Panic! At The Disco's "But It's Better If You Do" video. Due to low lighting I didn't get that many pictures. I was handed my goodie bag on arrival and it was almost painful not to dig through it. I think one of the nicest things about the evening was having Dan there. I'm always on my own going to Blogger events and it was so nice to have my two worlds mesh for once. Plus, I got to see Saibh, Sinead, Sandra, Mags, and Jen from ITWBN again (and so soon)! If you didn't know, I was shortlisted for the Best Newcomer award! Unfortunately, I didn't take home the prize this year. I'm honestly so proud of myself though. I can't even believe that I was nominated along side so many amazing bloggers. Finding out that I was shortlisted was one of the best moments of my life! After the awards portion was over, we hung around and had some more cocktails and finger food. As per usual, I had a good old dig through the goodie bag with a friend. Would you guys like to see a post about what was in the bag? I'm currently trying out some of the products and would love to share them with you! We had planned to go some where nice for dinner after but, we ended up hanging around for too long! Dan and I ended up in Super Mac's scarfing down food before getting the bus! For whatever reason, we had a totally miserable bus ride home. When the bus was dropping up off in Cork, we almost didn't make it off of the bus! Then... in all the worry about not getting off the bus.. I forgot Dan's backpack with my laptop. By the time we realized, the bus was already driving away. God bless Dan and his speedy legs. He actually ended up running down the road along side the bus at 4 A.M. I'm such a terrible girlfriend because, all I could do was laugh. Pretty hilarious end to an over all amazing trip. Don't worry! The Dublin Adventures aren't over yet! We already have a couple more plans to visit Dublin this summer. I'm keeping the Dublin Adventures an active topic here on Cardigan Jezebel! Loving the floor shot. . . and great hair!